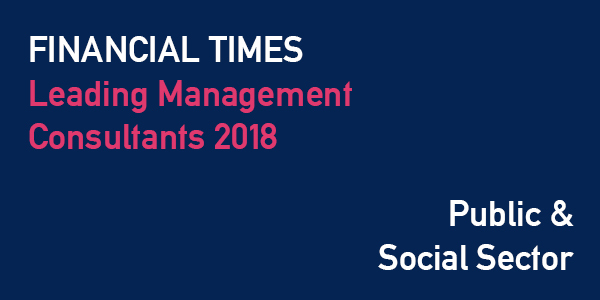 I am delighted that IMPOWER has been included in the Financial Times’s list of Leading Management Consultants, published today. The list is divided into categories, with just 26 companies listed under ‘Public & Social Sector’. IMPOWER’s inclusion not only recognises our strong reputation among our peers and clients, but also confirms that we are one of the leading SME consultancies in the country. The ranking is based on surveys, including surveys of consultancies’ clients. IMPOWER’s inclusion in the list comes after we were recently awarded maximum marks for quality under the Government’s ‘Management Consultancy Framework for Lot 5 Health and Community’, and were included in the group of successful suppliers. While these Frameworks sound – and are – complicated technical and legal structures, they are used by public bodies to evaluate potential suppliers and create a pool of companies who meet quality and cost requirements. Despite the dryness of this accolade, it is actually good news for our clients, as it means that suppliers on the framework have already been assessed, eliminating any ‘buyer beware’ concerns. Indeed, frameworks provide clients (in this case, local authorities and organisations in the health sector) with confidence that they are coming to a high quality, independently-vetted organisation and are doing so in a way that assures value for money. Such assurances are needed when putting together the typically large and complex contracts that are required when tackling challenges in the public sector. The Framework was a competitive process, involving the biggest names in public sector consultancy, and so it is all the more pleasing that in competition with such a group we received full marks for quality. We pride ourselves on delivering quality at every step of our client engagements, and are pleased that our efforts have been reflected by the FT’s list and by our successful selection under the Framework. Congratulations not only to my team at IMPOWER but to all of our clients too.